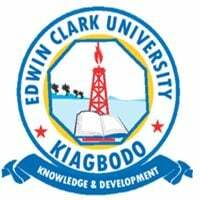 b) By visiting edwinclarkuniversity.edu.ng and download admission form under the admission menu, and submit duly completed application form at the University campus. c) By visiting Edwin Clark University Website at edwinclarkuniversity.edu.ng to register and fill the online application form located under the admission menu and submit. Complete and submit form on http://edwinclarkuniversity.edu.ng/admissionform/view.php?id=10556.